The training fees per participant are as given below. Taxes as applicable shall be extra. The fees are for 20 persons or less. For additional person(s) (upto a maximum of 25 participants), pro-rata increase will apply. The cost of travel/stay of faculty is to be borne by the client. Course material etc, shall be as per actual. Includes lunch/tea for the participants. Does not include charges for hostel/breakfast/dinner. Course material, etc shall be as per actual. b) Category II : All other locations/cities. All payments are to be made in advance through NEFT in the Savings Account No. 712210100000650 of Bank of India, Sector 62 Noida, U.P. Branch Code 7122, IFS Code BKID0007122 OR in form of demand draft in favour of Bureau of Indian Standards payable at New Delhi. In addition, Students & Consumer Organizations would be offered a discount of 10%. When a Govt. organization/PSU/Defence Establishment/Consumer Body requests for a discount, a flat rate of 5% discount on the training fees would be applicable. Any request for additional discounts over the above the above and citing specific reasons, may be considered on case to case basis. 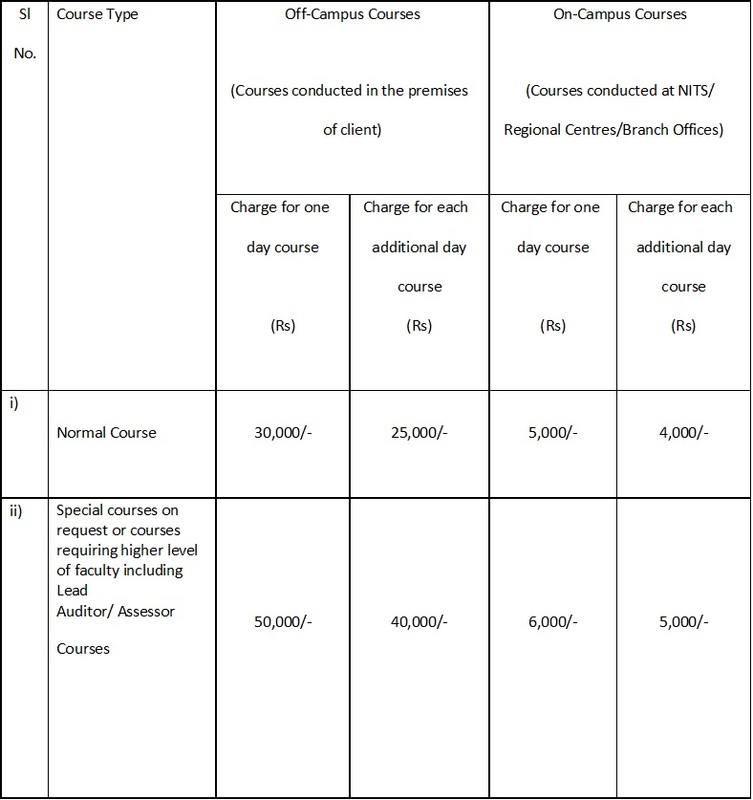 When an organization requests for conducting three or more training programmes (same programme or different programmes) to be held in series, one after the other or over a period of time (within one year), a discount of 10% would be offered on the training fees from the second programme onwards. When an organization requests for training programme for more than 25 participants which cannot be accommodated in a single programme and would therefore call for holding two or more programmes, a discount of 10% would be offered from the second programme onwards. A refund of full fees shall be made when cancellation/withdrawal of nomination is made at least 15 days in advance of the date of commencement of the training programme. In case a cancellation/withdrawal of nomination is made less than 15 days in advance of the date of commencement of the training programme or is not informed, a cancellation charge of 25% of the training fees would be levied. The balance amount after deducting the cancellation charges would be returned. Hostel fees if any, paid in advance shall be returned in full.